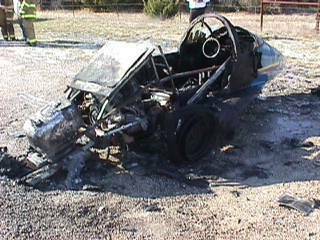 The Pulse is a very safe vehicle, but this 1985 model caught fire in Granbury, Texas on Saturday March 3, 1998. Bob Cervero was studying the above pictures. 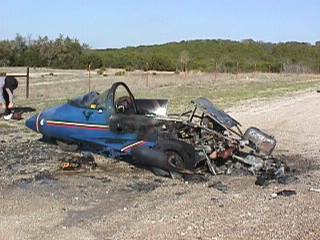 "It looks like that Pulse was running a Volkswagen engine and transaxle in a trike set up. Note the very large wheel where a Pulse has a smallout rigger wheel. Also there seems to be a red VW muffler near the back end. And I see another large wheel on the other side in the outrigger position. Ever heard of a Pulse in this configuration? 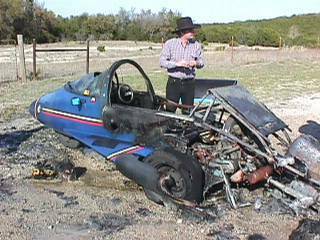 Thanks to Carl.....he supplied the following info....."The engine was a Porsche and it did burn but the owner has rebuilt it. Now it has a small block Oldsmobile V-8, if you can believe it. Only room enough for the driver and runs on only three wheels, front and two large outrigger wheels, no rear wheel. Owner does not know the VIN.